When Clara Gardner learns she’s part angel, her entire life changes. She now has a purpose, a specific task she was put on this earth to accomplish, except she doesn’t know what it is. Her visions of a raging forest fire and a mysterious boy lead her to a new high school in a new town but provide no clear instruction. As Clara tries to find her way in a world she no longer understands, she encounters unseen dangers and choices she never thought she’d have to make—between the boy in her vision and the boy in her life, between honesty and deceit, love and duty, good and evil... When the fire from her vision finally ignites, will Clara be ready to face her destiny? Instead of reviewing these books separately, I thought it made more sense for me to just share my my favorite and least favorite aspect of the series as a whole. I first purchased Unearthly over a year ago during a Kindle sale. And then it just sat there, waiting for me to finally read it. I'd open it every now and then, read a chapter, and then wonder why I bought it. Since my goal this year is to take control of my TBR, I decided it was finally time to knock it off my list. Once I got into the first book, I devoured the trilogy within about two weeks. One of the main themes of this series is the battle between free will and destiny. I really enjoyed this dilemma, including how it came into play with the love triangle. Although Clara is attracted to both guys, one is "destined" to be with her and the other is more "chosen" by her. In the first two books, the love triangle is handled really nicely. As a reader, you can see the appeal of both guys and Hand takes the time to really develop Clara's relationship with both of them. You get to see exactly what Clara likes about each guy, and they are definitely distinct and separate characters. The first two books avoided two common love triangle pitfalls: the "winner" wasn't obvious and it didn't feel like the triangle existed solely to provide conflict/drama. I loved what Hand created, and I was excited to see where it wen in the last book. Although I had a favorite guy, I liked both guys enough that I hated the thought that one would be hurt in the end. I had high hopes that Clara would handle the final decision with maturity and would treat both guys with the respect they deserved. Sadly, in Boundless, everything I'd enjoyed about the love triangle was undone. Clara led both guys on, couldn't make up her mind, and was generally pretty wishy-washy. Honestly, girl was on my last nerve. She didn't treat either guy right, and I really got frustrated with the book because of that. It also seemed like much of the book stagnant as Clara waffled between the two guys. The other books felt more fast-paced and Clara existed outside of the triangle. In the last book, it seemed like the choice between the two guys just overwhelmed her character. So, despite the good start, the love triangle was my least favorite and the most disappointing thing about this series. It's not even about who she chose because both guys were really well-developed, and I think you can understand her feelings for both. It's more about the decision process itself and the way it's handled. I start with my feelings about the love triangle because, to be honest, it ended up coloring my feelings for the whole series. While I loved certain aspects of the book, I think I'll be more hesitant to recommend these books now because of my frustration with Clara and how the series ended. Well, that was depressing. Now let me spend a minute telling you about my favorite aspect of this series: the angel mythology. Hand has really developed the angel world, and she does a great job of introducing to this world and its rules. Instead of just immediately explaining everything, she gives you bits and pieces of this world as you go along. I really loved that about these books because it gives you the feeling that there is always more to discover. You can really tell that Hand spent time thinking through how everything fit together, and that made this a really strong "angel" book (something I would typically avoid). The free will versus destiny debate also corresponds with the aspect of the book that deals with an angel's purpose. In each book, Clara is having a different vision. I loved seeing her try to piece everything together and working to try and uncover what it is that she's supposed to do. I particularly loved Hand's description and characterization of Black Wings, the fallen angels. One secondary Black Wing character, Samjeeza, ended up being my favorite character in the whole series. I would love to read a book dedicated just to him! I rarely say that about the "bad guy," but Sam was definitely a stand-out character for me. From the different types of angels to the way hell is portrayed, I really enjoyed how this aspect of the series was developed. It would have been so easy for Hand to simply write a love story with angels, but I appreciated how there was so much more to these books. So, while the love triangle was frustrating, I'd still recommend these books for anyone looking for a really well-developed angel world! I haven't read Boundless yet. I'm not sure if I am going to. I really dislike love triangles, and although I think in the first two books it's done well, it doesn't change the fact that I don't like love triangles. And based on what you said about Clara being all wishy-washy in Boundless - yeah, I'm not excited to read it. Yeah, it was really frustrating to see how the series ended! I don't absolutely hate love triangles, if they are handled well, but I DO hate when the main character just jerks everyone around. How hard is it to make up your mind?! And if you can't, I don't know that you really deserve either boy haha! I'm heard some good things about this series and definitely plan on giving the first book a try. I hate when a love triangle goes south! I don't object to them in general like many other people do, but I think what you described would really irk me. If I decide to check out this series, I'll definitely use the library instead of purchasing the books! So do I! I don't hate love triangles like some readers do, but I do get frustrated if they are handled the way they were in the last book. Yeah, I'd definitely recommend getting them from the library in case you feel the same in the end. 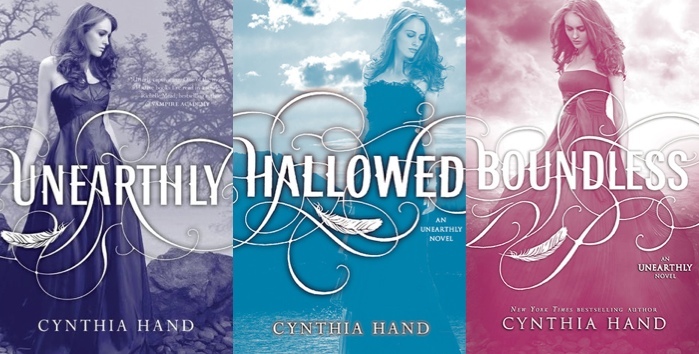 I got the first on sale and then bought the other two because I loved Unearthly/Hallowed, so I was irritated that the final book so affected my feelings for the series as a whole. I'm very tempted to give these a try. If the first two are great then the mediocre of the last may be acceptable to me. Great review. Thanks! I think you should definitely give them a try! I'm still glad I read the third just to finish out the series, and I really did enjoy the first two a lot. I really enjoyed Unearthly when I read it. As you've mentioned, the love triangle is started off very well in that book, and the hints of angel mythology included are pretty darn awesome! I'm curious to see what happens in the rest of the series, but I consider myself warned about the love triangle. Haha I love that you don't want to finish because you don't want to see it end! I think I'm the opposite - I don't want to see it end either, but I HAVE to know what happens. I really look forward to your thoughts when you do read it. I know some people weren't that bothered by the ending, so you may not be either! Such a great review! I love the way you dissect books! You think of things I never would-- probably because I'm too distracted by all the kissing. ;) Totally agree on Samjeeza-- since when is it that easy to like someone so bad?! I love that quote by the way. Haha love that Betty gets distracted by the kissing! The swoons are definitely strong with these books. YAYYYY for another Samjeeza fan. He really was such an awesome character! Okay well we've talked at length, and I still feel like I have a ton that I could say. THIS: I liked both guys enough that I hated the thought that one would be hurt in the end. --> THAT's what was toughest about this series for me, because ultimately when ___ got hurt, so did I. And then the flippant attitude of Clara towards how she chose, and then the guy that she didn't pick - how he would be affected forever - I just am still enraged about it. Then there are the things that just don't really fit into the story, which we have sort of discussed and I'm still confused about. BUT, I promise you, the rainbow and pretty birds and whipped-cream-with-a-cherry-on-top in this series was Samjeeza for me. He was so brilliantly written. His character was vibrant in all of his emotions, so easily visualized. I liked how he was handled in the end although I would have loved to *tweak* it just a little bit, but STILL. YAY for Sam. I'd love a book from his POV as well. Totally enjoyed reading these with you. I STILL HAVE MORE I COULD SAY ON THESE. Girl, trust. I just reined it in and wrote something that addressed my biggest complaint. But AMEN to the flippant attitude about it. So irritating! I don't care which "team" someone is on - I think they'd still agree that _____ wasn't treated right. And, honestly, neither was the guy that was chosen. Yes to the confusion! The big one for me was the whole thing with the character being brought back and how he changed, as well as why the bad guy got that ending. UGH! Sometimes I think about Samjeeza and get sad that this series wasn't actually about him. HAHA! And I loved reading these with you :) So much fun! Clara was super irritating in the last book. It made me mad how she refused to see how great Christian was ESPECIALLY when her mother found such happiness in her destiny with her father after fighting it for so long. Still loved the book for some strange reason. Epilogue was a cop out though. Dark Wings were some of my favorite scenes and I just really liked Samjeeza. He was so complex and complicated. Loved it. Great review, girl!